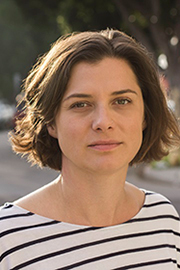 Ivy Pochoda is the author of the critically acclaimed novels, Visitation Street (2013) and Wonder Valley (2017), published by Ecco / HarperCollins. Wonder Valley is a Los Angeles Times and NPR Best Book of the Year for 2017. Visitation Street was chosen as an Amazon Best Book of the Month, Amazon Best Book of 2013, and a Barnes & Noble Discover Great New Writers selection. Pochoda’s writing has appeared in The New York Times, The Wall Street Journal, Los Angeles Times, Los Angeles Review of Books, The Huffington Post, Self, and House & Garden. Her first novel, The Art of Disappearing, was published by St. Martin’s Press in 2009. Pochoda teaches creative writing at the Lamp Arts Program in Skid Row where she helped found Skid Row Zine. Pochoda grew up in Brooklyn, NY, and currently lives in West Adams, Los Angeles, with her daughter Loretta and husband Justin Nowell.